ArticlesArticlesTruss Uplift: Who Would Have Ever Thunk It? The woman called in a frantic voice. "Mr. Durham, I live in a modest home in Athens and I've been told by a foundation repair contractor that I need $ 10,000.00 worth of floor structure repairs and a crawl space encapsulation system. I'm divorced, the mother of a toddler and can't afford this. Someone gave me your name and suggested I call you. My crown moulding along my central hallway and kitchen cabinets is separating at the ceiling...there is an approximate ½-inch gap there. I called the foundation repair contractors and they told me my floor was sinking due to inadequate foundation support. What I don't understand is that this problem seems to come and go throughout the year. It only happens during the winter months. Can you please advise me on what to do?" I asked the woman if she had any drywall cracks inside the home above interior doorways. She said, no. I asked if she detected any floor sag around the central hallway. She said, no. I then told her that I did not think she had a floor sag problem, but a roof truss uplift problem. 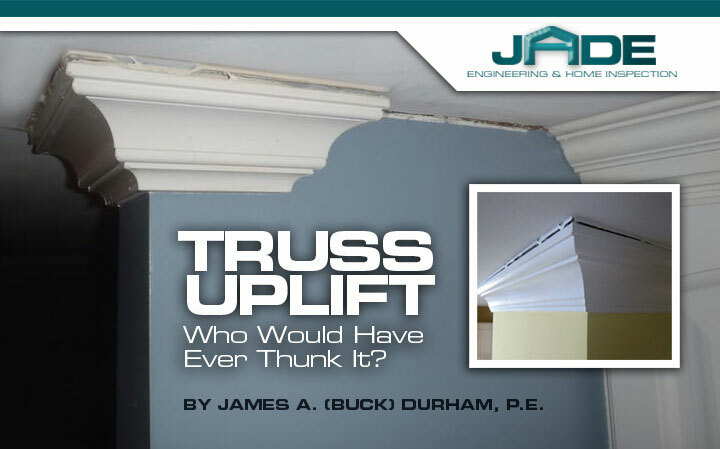 It is well known in the construction industry that metal-plate-connected wood roof trusses, sometimes develop structural distortion in the wintertime called "truss uplift." The bottom truss chords are buried in ceiling insulation and exposed to the interior central heating system and humidity levels inside the home, whereas the upper chords or roof rafters are located high in the attic space and exposed to the outdoor humidity and cold temperatures present in the ventilated attic space. The differential moisture/temperature contents between the upper, rafter chord members and lower, ceiling joist, bottom chord members, causes the individual trusses to physically distort -- the bottom chord members bend upward and pull away from underlying interior walls. The only reason this occurs is because trusses are "machines" - they are pin-connected, axial-loaded members, in either compression or tension. If one member of a truss moves or distorts, relative to another member, the entire truss distorts. Because of this known phenomena, all I had to do was inspect the attic space to see if there were roof trusses present, and then measure the floor elevations inside the home. I visited the home, inspected the attic, verified there were wood trusses present, and then used a four foot builder's level to establish that the floor structure was level. The owner was elated that she did not need to spend $ 10,000.00 to install additional floor supports when the problem was due to roof truss uplift. All that was needed was a cosmetic trick to nail the crown moulding only to the ceiling to keep or prevent gaps from forming between the walls and ceiling. If you have any unusual structural problems with your home, please give us a call. For a nominal fee, we will inspect your home, determine the cause of the problem and make recommendations for repair, if deemed necessary.